Welcome to Merlindale a 4 star imposing stone villa, situated in Crieff, Perthshire a popular holiday town in the centre of Scotland. Merlindale offers luxury bed and breakfast accommodation coupled with a warm welcome by owners Paul and Helen. Awarded the prestigious 2016 Certificate of Excellence award for Trip Advisor in Scotland´s bed and breakfast rating, along with "Taste Our Best" awarded by Visit Scotland, with previous owners John and Jacky. At our beautiful home, Merlindale, we will continue to offer exceptional accommodation and service. Our spacious bedrooms are all tastefully furnished with either luxury bath and shower ensuite facilities or a private shower room. Guests may choose between double or twin bedrooms with TV and complimentary WiFi in all rooms. Parking is available within our grounds. Breakfast is served in our elegant dining room with plenty of choice, whether you are having a lighter option, a traditional full Scottish or combination, all freshly cooked to order using finest Scottish ingredients and locally sourced where possible. Ideally situated on the Crieff to Perth Road, Merlindale is in a convenient location and the nearest B&B to Crieff golf course. Crieff Hydro and Crieff town centre are only a few minutes from where you can visit the shops, pubs and restaurants. Choose to eat out in a selection of first class restaurants and cafes or just amble through this picturesque town. 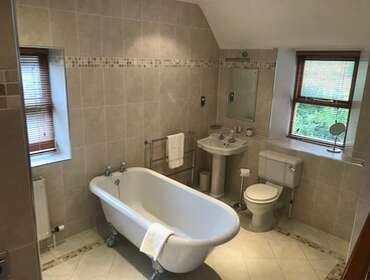 A number of pursuits for the outdoor enthusiast are also within walking distance, if you are thinking of luxury bed and breakfast in Scotland this is your place to stay. Paul and Helen look forward to welcoming you to Merlindale. The Bramble Room features a comfortable double bed and pillows with quality linen to aid you in a good night’s sleep. All bedrooms have hospitality trays, complimentary Wi-Fi throughout the house, TV in all bedrooms.